It’s been several weeks since I have been meaning to post this…I apologize. So I admit it…I went to French Culinary School without ever cooking a Julia Child recipe. Sure, I made many classic French dishes such as bouillabaisse, boeuf bourguignon, etc. but not once did I pick up Julie Child’s Mastering the Art of French Cooking. In fact, I actually didn’t even own the cookbook until my parents purchased it as a gift for me at Christmas in the middle of my culinary school program. I do have to admit I became obsessed with Julia Child without cooking her recipes or watching her cooking show. I have to sadly say it is thanks to that adorable movie Julie & Julia starting Meryl Streep that inspired this obsession. I watched this movie numerous times (as this too was gift at Christmas) and during my two-week road trip to Mexico I read the novel as well as Julia Child’s biography My Life in France. Well, I guess it took a move to Cozumel to motivate me to look back at the roots of my French cooking and to actually break the binding of MTAOFC. As I am sure you are aware, Cozumel is an island and I no longer have the convenience of purchasing the newest Food & Wine Magazine or the next hot cookbook. And again, craving something other than Mexican food I decided to look at an oldie, but goodie…newbie to me since I never actually cooked from the “bible”. Emily Egge I watched the movie Julie & Julia, I even read the book. I also read the Julia Child biography and now I am truly a believer…I just made my first Julia Child dish…Potage Veloute Aux Champignons (Cream of Mushroom Soup). Words can’t even describe…. Clifford she is the truth. With most of my cooking I had to take this dish to one more level…try something with a Mexican spin to it. During my visit to the grocery store for the ingredients of “Potage aux Champions” I came across a limey green root-like vegetable that I have never seen (though it turns out this is a common Polish vegetable as my fiancé mentioned his babcia use to cook with it in Poland). I asked in my poor broken Spanish to the grocery store employee “¿Cómo se dice?” She responded: “Keabo” which translates to “Kohlrabi” a.k.a. German turnip. The German turnip is not a root vegetable. In fact, this green bulb is a swollen stem that grows above ground. This vegetable is common in Central Europe, which explains why I never saw it on my dinner table as I grew up in the Michigan where our staple vegetable was corn. Although, it was difficult for my mother to get me to eat ANY vegetable for that matter unless it came with melted cheese whiz. Kohlrabi and a side of whiz please! 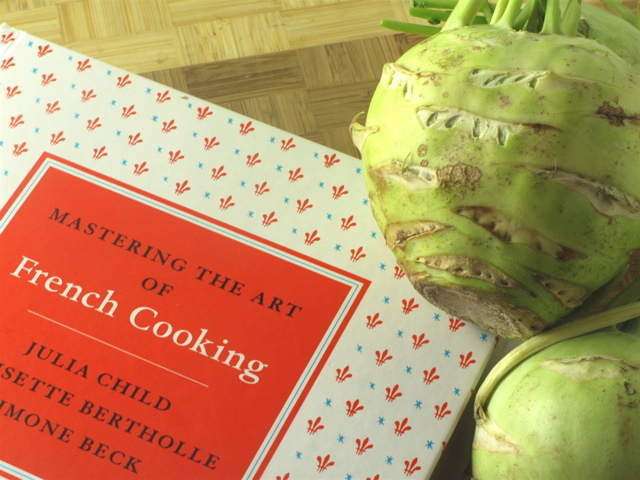 Not sure if Julia Child used Kohlrabi back in the day, but I wanted to pay tribute to her “Potage aux Champions” by creating a Spicy Cream of Kohlrabi Soup. Note on heat level: I stewed the soup with 2 habanero chilies. If you don’t like heat as my fiancé clearly didn’t…I quote “it really gets to my head”, kick it back a notch. Try other chili varieties or maybe just use one habanero. Experiment with it. 6 cups of boiling white stock or chicken stock (I didn’t have stock on hand and in Mexico often your stock comes from a boullion cube and water, so I used a chicken boullion cube with 6 cups of water). 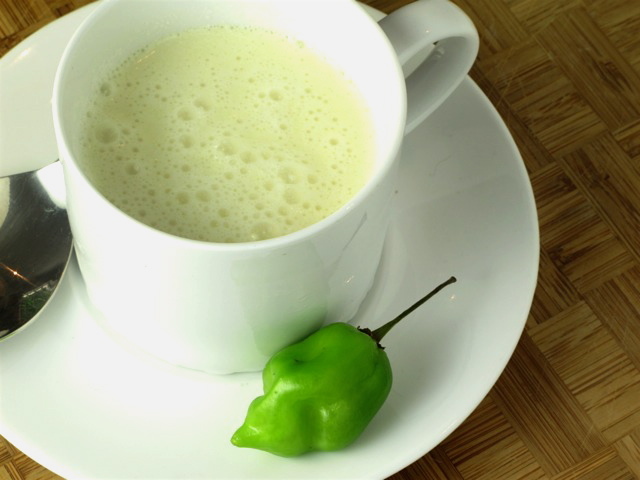 ½ to ¾ cup heavy cream (another item that can be difficult to find in Cozumel, so I substituted a mix of milk and Mexican crèma). In a heavy bottom 2½-quart stockpot sweat onions in 3 Tbsp of butter until softened. Add kohlrabi, sweating for 3 more minutes. Singer (dust) onions, kohlrabi and butter with flour and cook off the flour…this is creating a roux and helps thicken the soup. Add boiling stock to pot along with the parsley, thyme, bay leaf and habanero chilies. Cover pot partially and simmer for 20 minutes, skimming occasionally. Strain soup reserving the liquid. In a medium-mixing bowl, beat egg yolks and cream together with a wire whisk. Tamper the mixture with hot soup. Gradually stir in the rest. Season to taste. Return soup to stockpot and heat for a minute or two (do not let the soup boil). Before serving, stir in butter. Pour soup in bowls and enjoy with some fresh bread.